An historical novel about Korea? Not first on many Americans’ lists, one imagines. And the reason is clear enough: for most of us, Korea is a bit of a blank page, known for cars and consumer electronics, not to mention the roly-poly guy who rules the current northern half of that peninsula. But who among us knows anything about Korea before the Korean War in the early 1950s? Likely very few. The Court Dancer just might be the book that changes that. Author Kyung-Sook Shin is hardly a household name in the US, but perhaps she should be. She was the first South Korean and the first woman to win the Man Asian Literary Prize in 2012 for her novel Please Look After Mom, a story of loss, self-discovery, and identity that became an international bestseller. First published in South Korea as Yi Jin in 2007, The Court Dancer deals with similar themes, but on a larger scale. 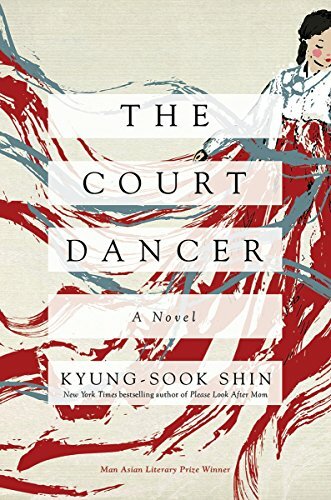 The Court Dancer unfolds against a background of dramatic economic change and social upheaval as the whole of East Asia is beginning to experience the throes of modernization as it opens up politically and economically to the West. The story takes place between 1891 and 1896 and is based on the real story of Yi Jin, a young “court lady” in the final days of Korea’s Joseon dynasty. Though culturally quite distinct, Korea is a dependent client kingdom of China’s Qing dynasty. Japan, however, is rising as a power and is beginning an aggressive effort to establish a presence on the Asian mainland. It will occupy Korea after its 1895 victory over China in the First Sino-Japanese War, annexing it completely 15 years later. The narrative opens as Yi Jin is about to sail for France with her lover, the former French legate to Korea. The obvious questions—who is this woman, what is her relationship with this Frenchman, and why is she heading to Europe?—are addressed in an extended flashback. Jin is an orphan who never really knew her parents. She is brought to the court when she is young to be trained as a “court lady,” basically attendants to the royal family who are forbidden to leave the grounds of the palace without special permission. Quite by surprise, Queen Min (whom Shin refers to only as “the Queen”) takes a liking to Jin, and for years Jin is frequently at the queen’s side, reading to her and, especially, dancing for her. In time, Yi Jin becomes the premier dancer at the court whose spellbinding performances bring her great respect and renown. Jin has one other skill as well—she speaks French, having been taught it by a French Catholic missionary before she comes to court. So when Victor Collin de Plancy arrives in Seoul to become the French legate in Korea, he is immediately captivated by this beautiful dancer who can speak to him in his own language. The two fall in love, though, given the social constraints on both of them, it takes some time. But with the acquiescence, even encouragement, of the queen (who has her own reasons for doing so), they are allowed to be a couple and Jin eventually is granted the unusual permission to leave the court to go to France with Victor. The modern life in Belle-Époque Paris is stimulating and exciting, and Jin meets the leading lights of Parisian culture and society, including the celebrated writer Guy de Maupassant. But although Jin is comfortable with wearing Western clothes and exploring their new ideas, she is still a foreigner, an exotic oddity, and this unsettles her. On the surface, The Court Dancer is plainly a story of contrasts. The relationship between Victor and Jin brings together a well-travelled Frenchman and a closely sheltered Korean woman. He is from a Western country that prides itself on its social openness and modern achievements; she is from a society of centuries-old, hidebound traditions of dress, status, and behavior. But beneath the surface differences are deeper questions of individual identity and purpose. Jin and Victor both struggle with their own family origins and personal loyalties to people and place. More broadly, they try to figure out what their respective cultures represent to themselves and to others. Who are they? Where do they come from? Where do they belong? And with whom? So The Court Dancer is a meditation on the social changes that force people to confront the double-edged swords of tradition and modernism. And though Shin does not expressly make the connection, the pertinence of this to the struggles of people in the 21st century seems clear. Shin is a distinctive and engaging writer whose work richly deserves a wide American audience.